Superintendent Tusha Penny addressed a near packed house when she spoke to the Club last Tuesday night. 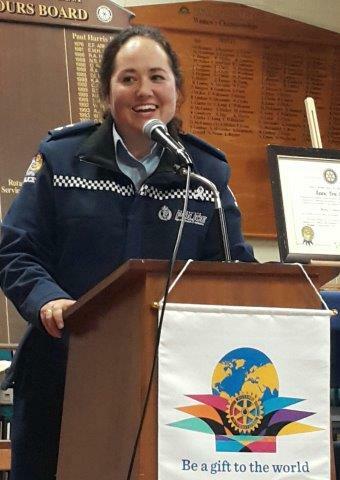 Tusha is currently the National Prevention Manager based in Police National Headquarters but she has really made her mark – or staked the ground in her previous roles leading up to becoming the national manager of child protection and sexual violence. Her story is very clear why she is in the Police which she regards as a privilege. 279 homes ring the Police in New Zealand daily with a call relating to family harm. Family harm is everyone’s issue and in most cases – someone knew someone who knew. Tusha talked about the death of two women who changed her direction. How do people live in homes where they get to point where a murder occurs? 57% of homicides in NZ are related to Family Violence. Also early in her career she spoke of dealings with probably the two most evil men in New Zealand – Stewart Murray Wilson and Graham Burton. These investigations told her that the NZ Police need to change. She and a couple of colleagues courageously stood up and said – How [did] do the Police get their response to family harm so wrong. Something different is needed. Significant resistance from within Police changed after Penny publically prepared to fight for values and resign for values. Tusha related a number of harrowing family cases which have now lead the change to significant recognition of Victims’ rights and safety. We need to be vigilant as a community. People how know something have to stand up and be heard. Superintendent Penny didn’t disappoint. She was strong and powerful and courageous in her message about preventing family harm. She is part of a group dealing with Government Ministers to keep the pressure on and make a difference. See the latest efforts in this media clip. Finally – if you or anyone you know is in a situation of family harm and want to talk about it Tusha has a message – Call her. – 0211922853. 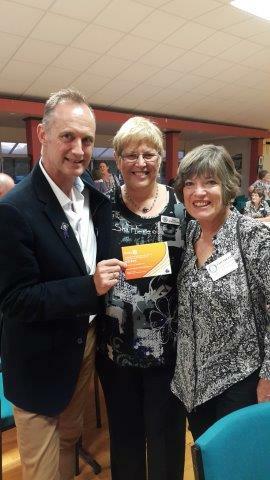 Tawa Rotary has inducted a new member - Bernie O’Loughlin, as he and his wife Margaret attended the 1 March meeting. Bernie has been sponsored by Don Shanks. 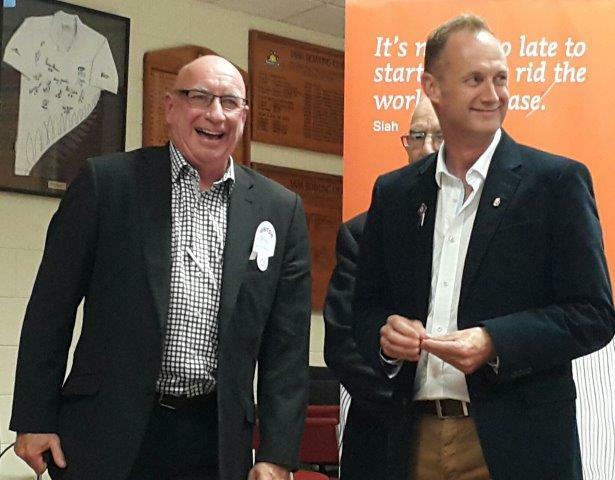 DG Simon Manning pinned on the Rotary badge as he welcomed Bernie to Rotary. Movie fundraiser – End Polio Now! 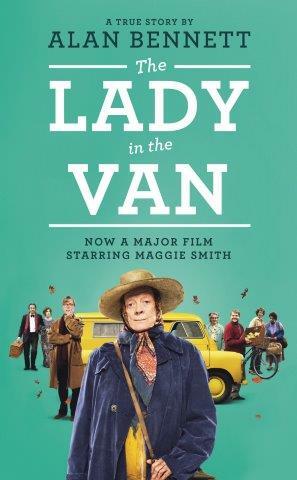 We have organised an off-site outing to view the movie “The Lady in the Van”. This event has been organised by the Rotary Club of Tawa as a fundraiser event for the Rotary Foundation END POLIO NOW! Project. As well as just having a fun night out. This occasion is open to all on a first-come basis and is limited to presold 60 tickets. I will be selling tickets and collecting money at Rotary on Tuesday 1st March. 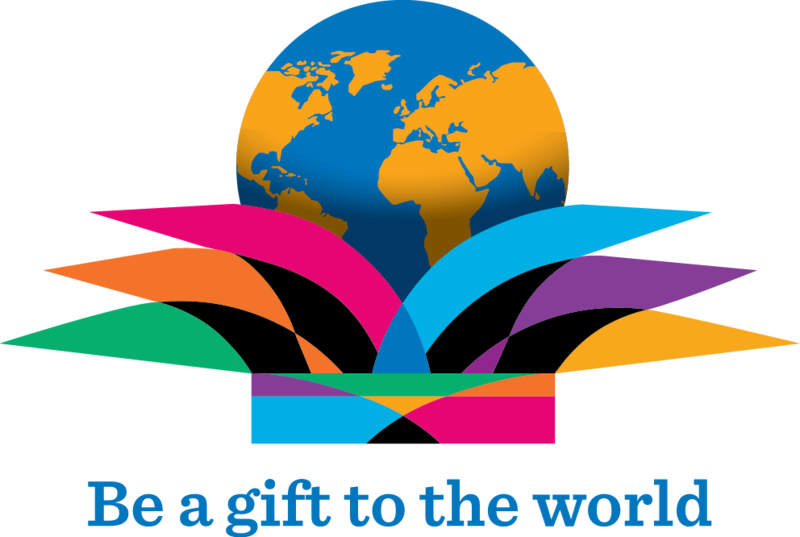 This is a good occasion to also invite potential Rotary (or Inner wheel) new members and to highlight one of Rotary’s most important and well known international projects – END POLIO NOW! Rotary has been behind support for polio eradication for the past 30 years and hopefully polio will be finally cleared from the world within the next 5 years – with only one country left as an active source of the polio virus. If anyone is definitely keen but unable to attend to the meeting on the 1st March – please let me [Richard Herbert] know to reserve tickets. Food: to maximise the donation to this worthy cause and to cater for the flexibility of everyone in terms of time and food requirements, no food or beverage is included in the ticket cost. Patrons are welcome to purchase their own food and beverage requirements direct from the Lighthouse café – in terms of selection availability it would be better to arrange this prior to the movie time. So plan to come earlier if at all possible and join in the fellowship also. 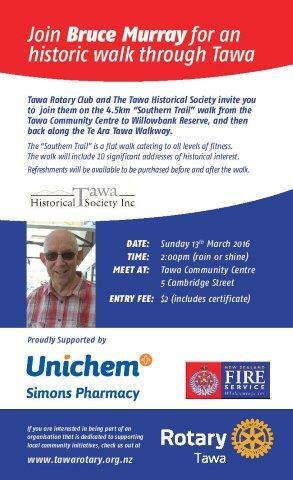 Tawa Rotary and the Tawa Historical Society are inviting our community to join a ‘Southern Trail’ walk on Sunday 13 March, 2pm (rain or shine). The Southern Trail is a 4.5 km flat walk from Tawa Community Centre to Willowbank Reserve and back along the Te Ara Tawa Walkway. Bruce Murray will address 10 points of historical interest on the walk. 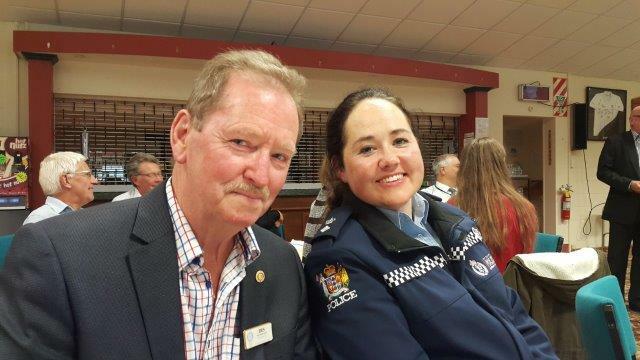 This is a significant community event that has been supported by Unichem Simons Pharmacy and NZ Fire Service. Please promote this event to your neighbours, family and friends. The Redwood Club has drivers, but is aiming to get two-person teams as a safety measure (same logic as the Longview Home wanting a driver and helper for their outings – just in case something happens). The members are all elderly and variously either dementia sufferers or stroke victims, mostly not too safe on their feet. In effect, each volunteer is “riding shotgun”, helping members on and off the bus or walking them to their doors. Additional volunteers are required for Mondays, Tuesdays, Thursdays and Fridays (Doug Burrus does Wednesdays). Each volunteer does one day per week. The duty goes from 3.30pm till 5.00pm and is not onerous. Club Members come from the Tawa, Porirua, Johnsonville and Newlands areas. If you are available to help, please call Wendy on 232 5521. DG Simon Manning pictured from left with Sue O'Sullivan and Elizabeth Sutton. DG elect Martin Garcia is encouraging us to attend this year’s District Assembly – being held at Palmerston North Boys’ High School on Sunday 10 April from 9am to 3.30pm. Please register with Pres elect Andrew Watson - registrations are required no later than 27 March. Martin asks: Please encourage as many of your fellow Rotarians to come along to District Assembly, especially incoming leaders and those who are new to Rotary and those who may be your future leaders. 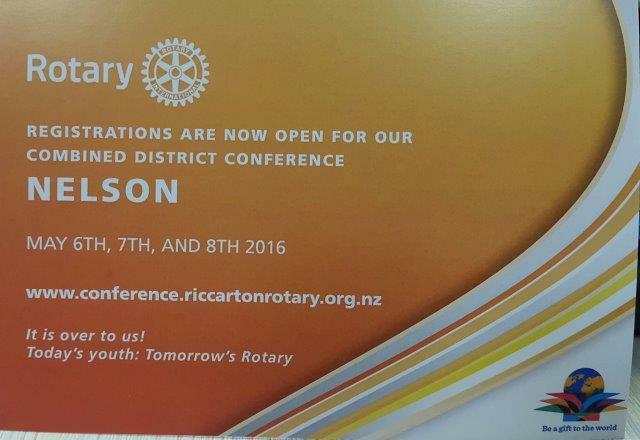 Rotary Club of Paraparaumu – it’s getting close. Enter Now - annual Charity Golf Tournament on Thursday 17 March 2016 at Paraparaumu Beach Golf Course. The charitable entry donations provide the opportunity to play the Paraparaumu Beach Golf Club’s superb links and win a week’s stay at Taupo Ika Nui Timeshare Resort. There’s a players draft for another such week. This event supports the Wellington Children’s Hospital. Entry forms at golf clubs or phone Bob 2988012. Email: rht.hamilton@gmail.com. Original generation time 1.8149 seconds. Cache Loaded in: 0.0364 seconds.